Tim “the Tyrant” takes his station and the Grotto trembles in fear. On Sunday, January 26, 2014, Pro. 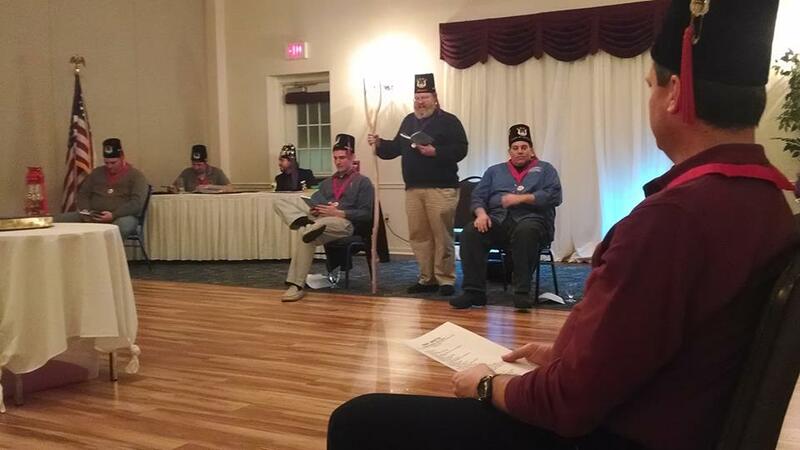 Tim “the Tyrant” Settlemyer took the throne of Ubar to lead his first meeting as Monarch. Prior to the meeting, the Prophets enjoyed a delicious meal and a talk by Pro. Dan Loughin, regarding home brewing. The most important lesson presented by Dan was the you should never clean your equipment with soap. Duly noted. Pro. Settlemyer also installed the two remaining officers – Pro. Shaun “Spooner” Sponagle as Captain of the Guard and Pro. Jeff “el Duce” Fulton as Marshal. With the other business out of the way, the meeting of the Grotto was called to order, or what passed for it at the time. Pro. George Hindson, PM, was especially rowdy, with several Prophets talking about investing in a muzzle for him. Instead, they just told him to pipe down… alot. The Monarch, carrying a large pronged stick, ruled over his meeting with vitriol and disdain, ensuring that no Prophet would contemplate rising up against his awesome bearded visage. Business was discussed and plans made for the visitation of Grotto Otto – our Grand Monarch, Otto Thiergart, who is coming to visit Ubar in February. As it was too cold for Pipes Papers, the Monarch forced Pro. Brent Richards to sing the Barley Mow, to the enjoyment of the Prophets present. We hope to see all the members in February for our Convivial and the Installation of the Colonial Grotto Association! Until then, down with the Tyrant Tim!